- FRANCE – Embrun - Alors qu’ils menaient une campagne de fouilles depuis presque une semaine dans la chapelle des Capucins, c’est l’ultime jour, vendredi dernier, que les deux archéologues, Nathalie Nicolas et Romain Aimé, ont fait la trouvaille. Elle était là, cachée sous le support de l’autel : une dalle de 50 centimètres de côté. « C’est une pierre de consécration de l’édifice, protégée par une ardoise, décrit Nathalie Nicolas dans le Dauphiné Libéré daté de ce jeudi. Une inscription raconte la consécration de l’édifice, le 19 mars 1647. Cette pierre avait été volontairement enfouie, comme un rituel lorsqu’on pose la première pierre d’un édifice », poursuit l’archéologue. 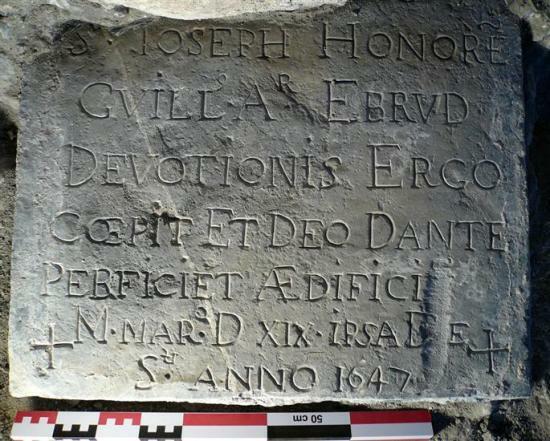 L’inscription, dont il manquerait une ligne, est en cours de transcription. - NOUVELLE-ZELANDE – Te Puna - The discovery of 15 food storage pits during work on new sports fields at Maramatanga Park in Te Puna may have slowed the project but it also offered an insight into the area's early residents. 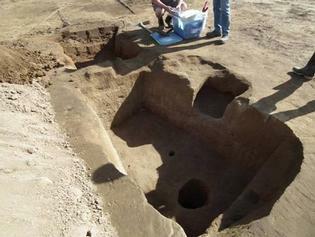 The storage pits, which varied in size but averaged about 2m by 1m, were probably used for kumara and rua (potatoes) and there may be potential to have a starch sample from the site analysed to confirm just what was kept in the pits. Julie Sparham, an environment manager for Pirirakau Incorporated Society, says archaeologist Dr Louise Fury, who has studied the Omokoroa Peninsula, suggests that some Maori settlements were nomadic, the sites being used and re-used over many years. Sometimes used as the main kainga (village), these sites may also sometimes have been used to grow food and store it, before the residents moved on. They would eventually return and re-use the storage areas and supplies seasonally. "Given that the Bay of Plenty was one of the most highly populated regions in times of early Maori occupation, a discovery wasn't unexpected," Julie says. "If the topsoil layers are removed you can see clearly if there has been any modification or archaeology because of the different colour of the disturbed soil. As well as the storage pits, archaeologists also found a number of small oven "scoops", probably for cooking shellfish and it may be possible to carbon date a shell. - ROYAUME-UNI – Didcot - Archaeological remains dating back thousands of years have been uncovered on the site of new homes at Didcot’s Great Western Park development. Archaeologists were called in as digging uncovered ancient artefacts during work to build the 3,343-home development, off the A4130. The oldest findings are a Neolithic flint arrowhead, used by early hunters, and a bowl believed to be for ceremonial purposes. Ten circular houses were discovered, believed to be part of a late Bronze Age and Iron Age hillcrest settlement at the site. They were identified by a ring of post-holes and timber-framed structures, which are believed to have supported a thatched roof. Similar square structures have also been found, thought to have been used for food storage. Other findings include a Roman villa and farmstead and a perfectly preserved medieval horse burial, which appears to show that the animal was put down because of a broken leg. 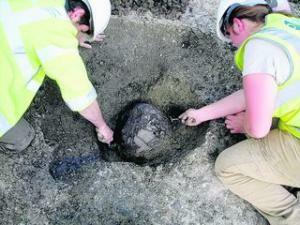 Taylor Wimpey commissioned the dig to ensure that historical findings on the site were preserved. They will be built over once they have been catalogued by the firm for posterity. Chris Ashmore, marketing director for Taylor Wimpey in Oxfordshire, said: “There have been some exciting historical discoveries at Great Western Park, which give us an insight into the past and traces the history of the area back to 3,500BC.” The archaeological work is set to continue alongside the building work and once Great Western Park is completed, a full report will be published. - AZERBAIDJAN – Ganja - Archaeologists have unearthed a large 12th-13th century kiln for firing bricks in Azerbaijan's second city, Ganja. "We have found four tiers to the kiln and there may be even more," Arif Mammadov, head of the Ganja archaeological expedition, told 1news.az. "Archaeological digs need to continue if we are to find more. I would like to stress that this is the largest kiln found in Azerbaijani territory," Mammadov said. Archaeologists from the National Academy of Sciences' Institute of Archaeology and Ethnography and the Ganja Regional Scientific Centre resumed excavations in and around Ganja on 1 to 5 March. 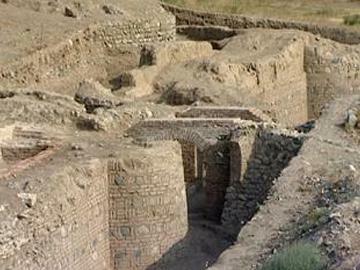 The expedition also found the ruins of a medieval town and cemetery during digs in Ganja. - SAMOA - - American Samoa includes a group of five islands in western Polynesia in the South Pacific. The NDSU (North Dakota State University) research group unearthed ancient stone tools, ornaments, fishhooks, shells, rocks and one very unexpected find. “I’ve never excavated anything like it,” said Clark, an archaeologist for more than 30 years. What the NDSU student researchers discovered was a single large clay pot used for cooking, completely intact. “Nothing like that has ever been found in that region of the world,” said Dr. Clark. “We conducted the excavation of the pot with dental picks, a 2-inch soft brush and a small wood splint until it was completely exposed,” said NDSU student Clayton Knudson, of Harvey, N.D. The moisture-saturated clay prevented removing the pot as one solid unit, as it began to fragment. All pieces, known as sherds, were carefully removed, numbered and shipped back to Fargo, N.D., with 18 boxes of artifacts for further study. Students in the archaeology lab at NDSU are working painstakingly to reconstruct the pot, but the poor condition of the sherds will limit what can be done. Clark will use a laser scanner in his lab to create 3-D models of the intact sherds that will allow creation of a digital 3-D model of the pot. Though radiocarbon dating has yet to confirm the age of the clay pot, Clark estimates the rare artifact may be as much as 2,500 years old, placing at about 700 B.C. - ROYAUME-UNI – Airlie - Two Bronze Age burial pots containing human remains have been found at the base of a standing stone in Angus. Archaeologists excavated the ground around the Carlinwell Stone at Airlie, near Kirriemuir, after it fell over earlier in the winter. Both pots - known as collared urns - could be up to 4,000 years old and were typically used in early Bronze age cremation burials. The 7ft (2.1m) high monolith will be re-erected on Friday. One of the pots is about 4in (10cm) in diameter, and the other is about 8in, the archaeologists said. The pots are typical of early Bronze Age cremation burials.People were burned on pyres and their remains gathered, put into pots and buried upside down in a pit. Melanie Johnson, from CFA Archaeology of Musselburgh, said there was "plenty of bone" inside the pots, which would be enough to determine the gender and age of the person, and if they had illnesses or trauma wounds. "They will be taken to a lab in Edinburgh, and radio-carbon dated," she added. John Sheriff, an investigator with the Royal Commission on the Ancient and Historic Monuments of Scotland, said it was impossible to date the stone precisely but it is very likely to be neolithic or Bonze Age, and could "easily" be 4,000 years old. "Human bones were found at the base of the stone in the early 18th Century, and my hunch is they were also Bronze Age, although it's possible there is no connection."